- Power supply section added. Everything goes thru shunt regulators, as i don't want the data/audio-correlated noise to go all over the place into transformers etc. - Some pin swappings for better layout. - 106 resistors on the PCB. Heck, i'll add another 10 for PS input section. - Ground planes to come, with cutouts etc. - Power/thermal things should be calculated to check whether design is viable. - Shielding cage for oscillator. - "debug" resistors for WM8804 - on 12MHz and MCLK outputs - to measure their phase noise performance. So far, layout is 85% complete. - Oscillator power supply should be simulated, as it is a kind of "mock-up". Op-Amp as a buffer for heavily-filtered LED reference, fed from Op-Amp output. Shunt regulator for OpAmp to make sure the currents won't flow all over the PCB. Noise will mostly be OpAmp's, so a good low noise opamp, with enough power output, rail-to-rail (or at least 5v compatible), and good PSRR should be used. Simplified board, no CPLD, 44.1k-only support for back syncing. Thus "CD" in the name. Now with schematics! Whew, that was rather crazy /done it in 1-1.5 days/. 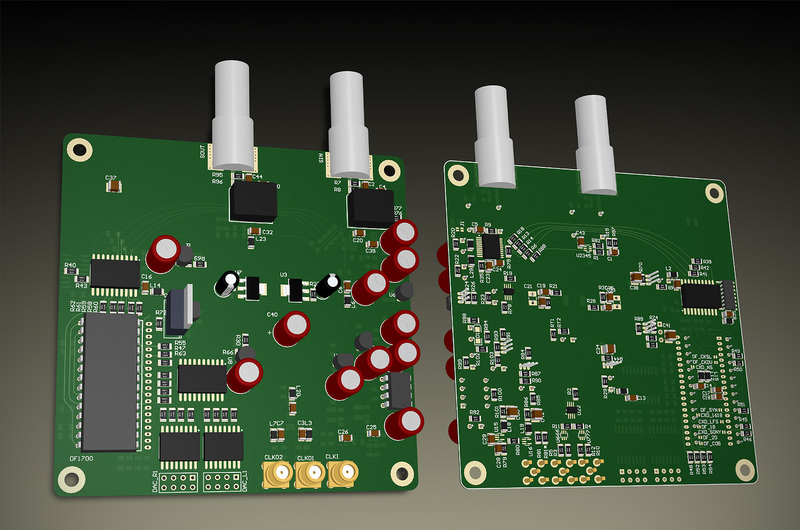 PCB layout would be... meh... interesting. in two layers. This board is based on backsync SPDIF interface i've verified - here. This board fills the gap between any SPDIF source and DAC boards. - Both async and sync operation. It supplies SPDIF OUT for back syncing, and works on local clock. - Support of the whole classic bunch 44.1/48/88.2/96/174/192kHz SPDIF sampling rates, even if the DAC IC used won't accept anything higher than classic 44.1kHz. 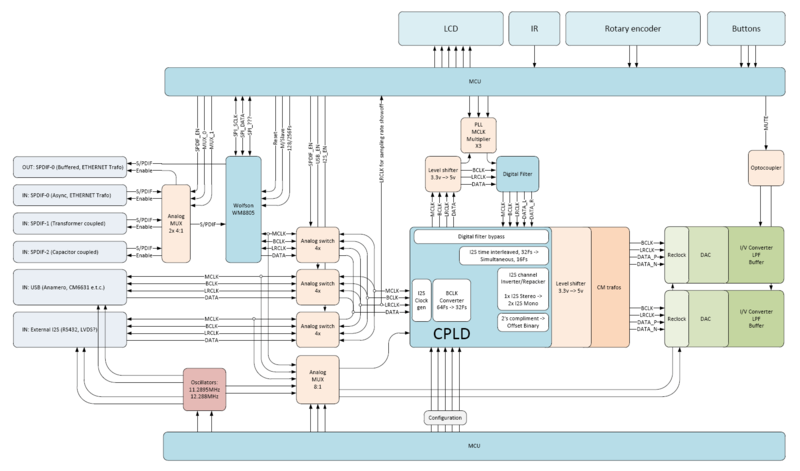 Now TDA1541, PCM58, PCM63, AD... and many other ICs could play Hi-Rez content. In NOS (Non-Oversampling) mode. Actually, these uber-KHZ formats are kinda made for eliminating the digital "artifical" oversampling stage in "natural" manner. So why bother oversampling 'em futher? We ain't going with deltasigmas, not yet (hehe!). - Use different bunch of DACs, DFs and their combinations - how about TDA1541 in simultaneous-load mode, dual differential, with DF1700 in 8x oversampling? I need to get PMD100 and SM5842 compatibility for DFs and AD1862, TDA1547 (SAA7350) and PCM1700/2/4 for the DACs. TDA1543/A? Maybe in el-cheapo version, in dual-differential mode to suppress it's 2nd-order harmonics. "Just for fun" thing. 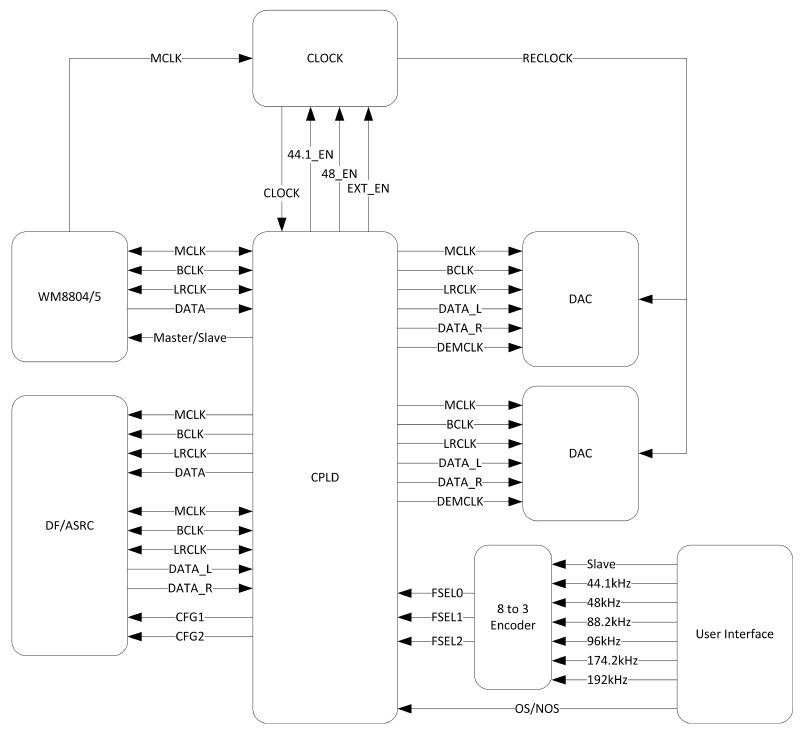 - Bit truncator - truncates 64fs bitclock into 32fs bitclock to connect TDA1541 directly to WM8804/5 at 174/192kHz rate and not to overdrive BCLK input (5.6MHz maximum). 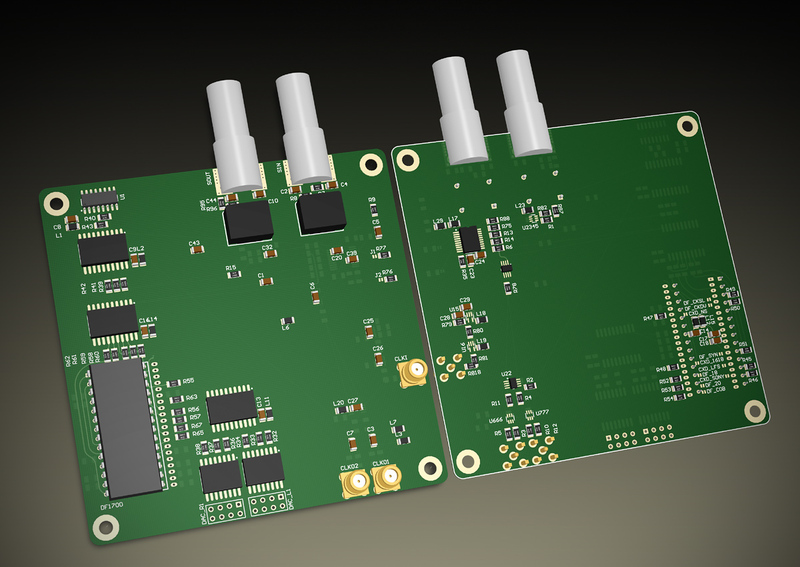 - I2S splitter - splits I2S stereo to two I2S each of which carrying separate channels in direct and inverted ways - so two DACs with I2S inputs could be connected and each one will be used as single channel (dual differential). - I2S to paralel - done for 16bit 32Fs BCLK, needs work for other BCLK rates and right-justified data (to make it BB DACs-ready - direct SPDIF to paralel load at 174/192kHz NOS thing?). 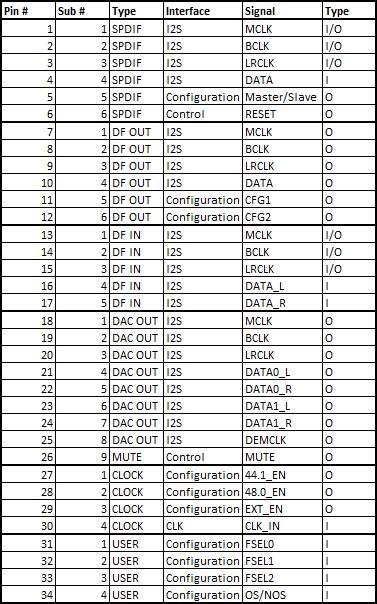 - Clock management - 44.1/48/Slave switching, I2S control lines generation for WM8804/5 slave mode. - OS/NOS mux switch to bypass DF. - Fit all these things into single 72-macrocell CPLD. - "Develop" xtal oscillator circuit for low-enough jitter performance in Master mode. This one is tough. - PCB for all these things. Given the CPLD works on 3.3v and tolerates 5v on it's inputs - i can use 5v-powered HCT logic buffers for CPLD outputs into DAC/DF ICs. WM8804/5 stays at it's native 3.3v. There is no viable USB 2.0 async interfaces out there, so i'm sticking to SPDIF as the standart de-facto for sync/async audio interface. The "back-sync" thing could be easily added to most of CDPs and some network streamers. Most PC (PCI) sound cards could be used for back-syncing as long as they have SPDIF input.